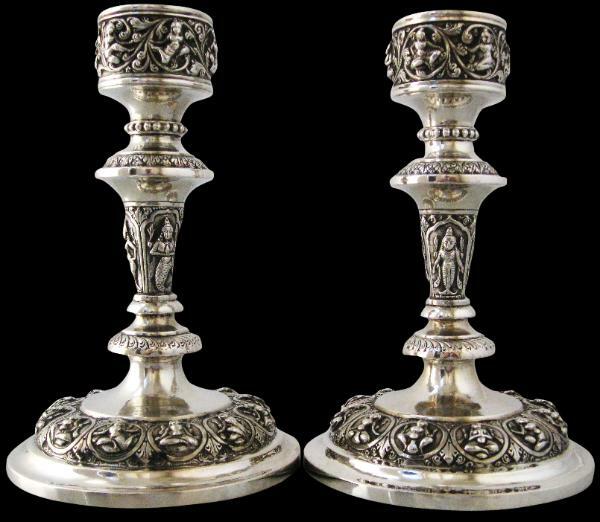 This is the first time that we have encountered a pair of ‘swami-ware’ silver candlesticks. Swami ware was so named because of the decorative themes based on Hindu deities and the associated festival processions, a style of silverwork adopted by silversmiths in the southern Indian city of Madras for local patrons and for export. This pair is of particularly elegant proportions. The base of each is decorated with twelve roundels filled with a seated deity amid scrolling foliage, a motif repeated on the well of the stick and the stem. The bases of each have been filled with a composite material this giving each stick a good weight. Their condition is excellent, with no dents or repairs.